There's never been any mystery about why the world's most famous luxury liner plunged to the bottom of the frigid North Atlantic on a moonless night during its maiden voyage almost exactly a century ago. The smoking gun was a block of ice  a massive berg that had calved away from Greenland and drifted down into the heavily traveled shipping lanes. 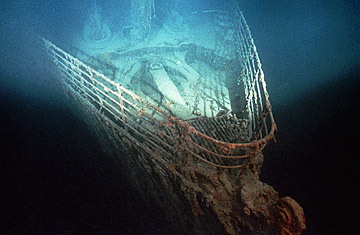 On April 15, 1912, the unsinkable Titanic met the unmovable iceberg and in less than three hours, the ship was no more, taking 1,500 passengers and crew members down with it. That's the direct cause of the tragedy anyway, but there were plenty of contributing factors  a ship design that wasn't nearly as robust as everyone thought; a decision by the captain to forge ahead at high speed, despite reports from other ships of an unusual number of icebergs in the area; a push by the ship company's managing director to make the crossing in record time for bragging rights. There may, however, have been an unindicted co-conspirator, one that's gone overlooked for all these decades: the moon. That conclusion doesn't come from astrologers finding dark portents in the star charts of 1912, but from two physicists from Texas State UniversitySan Marcos, who lay out their very credible case in the current edition of Sky & Telescope. The authors, Donald Olson and Russell Doescher, along with Roger Sinnott, a contributor editor of the magazine, begin with an improbable convergence months before the Titanic set sail  on Jan. 4, 1912, to be exact. On that day, the sun and the moon lined up with the earth in such a way that their combined gravity led to a cycle of unusually high and low tides. By itself, the phenomenon is not that uncommon; indeed, it's a very familiar one, known as the spring tides  even though they don't necessarily occur in spring. But in 1912, the spring tides were special. At almost exactly the same time they were occurring, the scientists determined, the moon just happened to make its closest approach to earth in 1,400 years. The moon's orbit is slightly oval, so it oscillates between closer and farther away every month; but there's a slight wobble on top of that so that on occasion, close becomes extremely close and far becomes very far  at least by earth-moon standards. In 1912, the unusual proximity of the moon made its gravitational pull just a little more powerful than normal. Worse still, on Jan. 3  only one day earlier  the earth made its closest approach to the sun, which happens every year at this time. That meant that solar gravity was stronger than usual too. That all of this would converge at precisely the right (or wrong) moment in the moon's monthly procession around the earth  never mind the earth's annual procession around the sun as well  impressed even the scientists. "It's remarkable," Olson said in a statement. "The full moon could be any time of the month. The perigee [the moon's usual close approach] could be any time of the month. Think of how many minutes there are in a month." So the tides on Jan. 4 were not just high, but higher than they'd been in many hundreds of years. At first the physicists theorized that the rising sea might have forced extra icebergs to break off from Greenland, and indeed that might have occurred. But to get into the shipping lanes by April, any fresh floes would have had to swim against the prevailing currents, which would have been impossible. Instead, the new theory suggests, the killer berg might have been an old one that had become grounded in the relatively shallow waters around Labrador and Newfoundland. Icebergs often run aground there, but the historically high tides may have freed a number of them, turning the shipping lanes into the deadly minefield they became that April. It's an ingenious piece of detective work, and it could well be right  although it can't ever be proved definitively. Admits Olson: "We don't claim to know exactly where the Titanic iceberg was in January 1912  nobody can know that  but this is a plausible scenario intended to be scientifically reasonable." SPECIAL: TIME Commemorative Reissue: "Voyages to the Bottom of the Sea"